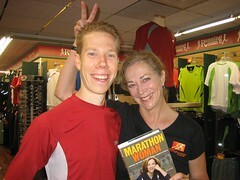 Both Mike and I had the extreme pleasure of helping with the planning for a visit by Kathrine Switzer to Mayo and the Running Room this week. She came and spoke at Mayo Clinic Monday night where Mike and I helped to sell her book. Mike even was able to go to dinner with her and a few of my colleagues (I was relieving the babysitter). Then Tuesday morning Mike led a run with her from the Running Room. If you don't know who Kathrine is, she is the first female to ever enter and run the Boston Marathon. She ran it back in 1967 before women were officially allowed to run in the race and at a time when it was believed that women were not capable of running more than 200 meters (2 laps around the track). She was also instrumental in getting the women's marathon recognized as an Olympic sport (though it took a while -- the first time women ran it was at the 1984 Olympics). Kathrine is a spitfire and was incredibly entertaining and very gracious to us for helping her out. Mike had an awesome time sharing his running story with her and just talking the talk with a fellow marathoner. It was a great experience!